When you or a loved one are charged with a crime, it can be a frightening experience trying to navigate the intricacies of the criminal justice system. An experienced and dedicated Oakland criminal defense attorney will provide you with quality representation, taking the time and effort necessary to thoroughly investigate your case and build an aggressive defense on your behalf. At Bay Area Criminal Lawyers, PC, we are a team of Oakland criminal defense lawyers who are dedicated to providing our clients with the personal attention and focus necessary to reach favorable verdicts. Criminal offenses bring serious penalties; your freedom, reputation and future are at stake. It is important that an experienced Oakland criminal defense lawyer has a thorough knowledge and understanding of how criminal laws work, and how to challenge any and all evidence brought against you. There are plenty of Oakland criminal defense lawyers to choose from, but not every lawyer has the expertise or working knowledge of a particular county or courthouse. The criminal defense attorneys at Bay Area Criminal Lawyers, PC have successfully handled hundreds of criminal cases out of Oakland at both the Rene C. Davidson Courthouse, and the Wiley W. Manuel Courthouse. At Bay Area Criminal Lawyers, PC, we are confident you will be pleased with the results our dedicated team of Oakland criminal defense lawyers obtain in your case. 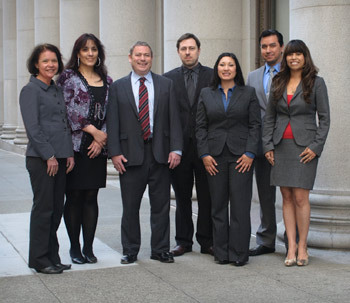 As a team of highly knowledgeable and experienced Oakland criminal defense lawyers, we will work tirelessly to uncover every detail of your case to get the most favorable results possible. We will gather and review all evidence, work with forensic and investigative experts and do everything in our power to secure a positive outcome in your case. When your future and freedom is at stake, you need an experienced Oakland defense attorney skilled and focused on only one thing – getting the best outcome possible. No matter the crime alleged, you have right to seek justice. It is crucial that you have a team of competent Oakland criminal defense lawyers on your side when facing criminal charges. Protect your freedom by contacting Bay Area Criminal Lawyers, PC. Our tenacious team will work diligently to put your future back on track and seek the justice you deserve.